The Cuban Democratic Directorate and members of the exile community attended a Mass officiated by Father José Luis Menéndez to pray for the souls of Harold Cepero Escalante and Mario Manuel De la Peña on Friday, December 28, 2012 at 8pm at Corpus Christi Church. Father José Luis Menéndez gave a powerful homily on the spiritual aspect of a just struggle for freedom. Father Menéndez also explained that peace is founded on four pillars: The first is the truth. There cannot be peace where there is not truth. There cannot be peace where there is not justice. There cannot be peace where there is not love. Hate can never achieve peace. There cannot be peace where there is not freedom. If one of these four pillars is absent said Pope John XXIII peace collapses. Friends of Harold Cepero Escalante sent a video that was played after the Mass talking about their martyred friend. Mario Manuel De la Peña's parents attended the Mass and his father spoke about who his son was. Some of the activists who attended the Mass took a group picture afterwards with Father José Luis Menéndez. The Mass was held on December 28 because it is the Day of the Holy Innocents which is a religious holiday named in honor of youth slaughtered on King Herod's orders around the time of Jesus’ birth. These young victims were called“Holy Innocents” because they were too young and innocent to have committed any sins. Both Harold and Mario were also innocent and in their nonviolent defense of human rights and dignity of the Cuban people they were following a path first blazed by Christ, his apostles and later Christian Martyrs. Mario Manuel de la Peña was one of four men shot down by Cuban MiGs on February 24, 1996 while searching for Cuban rafters in the Florida Straits in international airspace. Mario was 24 years old when he was killed. Harold Cepero Escalante was a youth leader in the Christian Liberation Movement and died under suspicious circumstances with its founding leader Oswaldo Paya Sardiñas on July 22, 2012. Harold was 32 years old at the time of his untimely death. Family members are demanding an international investigation into the deaths of Harold and Oswaldo. On Friday, December 28, 2012 Mario Manuel de la Peña, who was born in the United States in the township of Weehawken, New Jersey in 1971, should have been 41 years old. One month and a day later on January 29, 2013 Harold Cepero Escalante, who was born in Cuba in the municipality of Chambas in the province of Ciego de Ávila in 1980, should be celebrating his 33rd birthday. Sadly, neither young man will have the opportunity to do so. December 28 is the Day of the Holy Innocents and is a religious holiday named in honor of the young children slaughtered by order of King Herod around the time of Jesus’ birth. These young victims were called“Holy Innocents” because they were too young and innocent to have committed any sins. Both young men were human rights defenders who nonviolently sought to save lives and rescue human dignity. The Cuban Democratic Directorate and members of the exile community are offering a Mass officiated by Father José Luis Menéndez to pray for the souls of Harold Cepero Escalante and Mario Manuel De la Peña on Friday, December 28, 2012 at 8pm at Corpus Christi Church located at 3220 NW 7th Avenue Miami, FL. The MCL Coordinating Council has decided to re-release the Christmas message of 1990, which our national coordinator Oswaldo Payá wrote on behalf of our Movement. Reading it we found that its contents, twenty one Christmases later remains equally beautiful and appreciated. Today, on behalf of your people, we say to you: Thank you for this gift Oswaldo. Hopefully Cubans today will start making this utopia possible. The rifles will be buried face down, the words of hatred will vanish in the heart without reaching the lips, we'll go out into the street and all of us will see in the other a brother, let us look to the future with the peace of he that knows that he forgave and he that has been forgiven. Let there be no blood to clean or dead to bury, the shadow of fear and of catastrophe will give way to the reconciliatory light, and Cuba will be reborn in every heart, in a miracle of love made by God and us. That will be the Liberation, it will be the new life and all of us will have the sensation that we are all good and want to be good, that everyone wants the other to be happy, it will be like that special time, and it will be like Christmas, that same Christmas when Jesus arrives. Cubans!, that this hope not die, let us not be discouraged. We believe it is possible and we work and struggle with all our hearts, to make this, that many call utopia, possible and for which, if necessary, we will give our lives without claiming the lives of others. That those who hold power and for a long time have had great privileges and have lived as the rich in the midst of a poor people reflect on it. The people have no voice and want to express themselves. The nation disintegrates and Cubans want to save her, save Cuba for all, Cuba is greater than the power of a few and those that have that power that do not feel attacked, because the people awake, do not abuse the nobility of the Cuban people. Come on men of power! For you to there is a place among the people if you descend from the stands, and that is better than power. Let all within Cuba and outside Cuba reflect. Let us act with great courage, but with a lot of responsibility, with great firmness but especially with much love. Let us not turn to violence and force, but we will not submit or allow ourselves to be intimidated by them. Yes, we want change, changes in all of society, because the heart of Cuba has already changed, and we have renovated it in hope, work, suffering and sorrow. We have renovated ourselves and do not want Cuba to sink and our children with her. That violence not explode, that repression not explode, that the truth break out, and let there be an outbreak of Peace and Freedom. No one in Cuba wants to submit to a foreign power, or return to other forms of injustice. Let us not fool ourselves any more, Cubans know what we want: we want reconciliation among all, we want a reunion with our distant brothers in exile, we want to work for our Country and our families, with boundless generosity to our hard work and positive creativity, we want dialogue, we want to solve this juncture of our history together, with love, we want freedom. We know it is possible and we will achieve it, it will be everyone’s victory. Yes, Jesus is coming, he who was also a victim of violence, victim of the mob and its repudiation, victim of the pride of the powerful and of the slaves of the lie. Jesus is coming and he brings the victory of life over death, of love over hatred. He is the only one who brings true Liberation. That is Christmas. 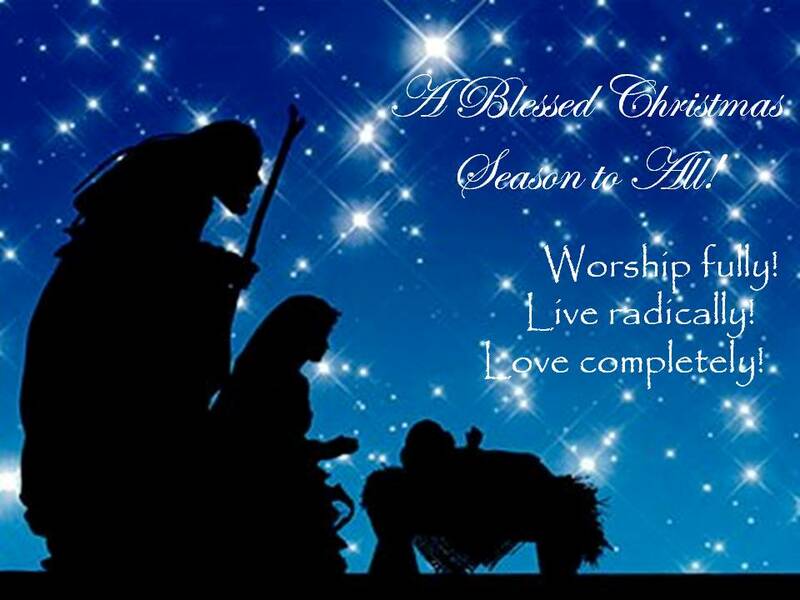 The Christian Liberation Movement wishes you a Merry Christmas! The original Spanish text is available here. An actual embargo would mean that there is a complete ban on or prohibition of trade by the United States with Cuba. This is not the case. What you have in Cuba is a partial embargo which is exactly the same in definition as economic sanctions. Between January 2000 and September 2012 according to the United States Census Bureau there has been $4,291,200,000.00 in U.S. trade in goods with Cuba. 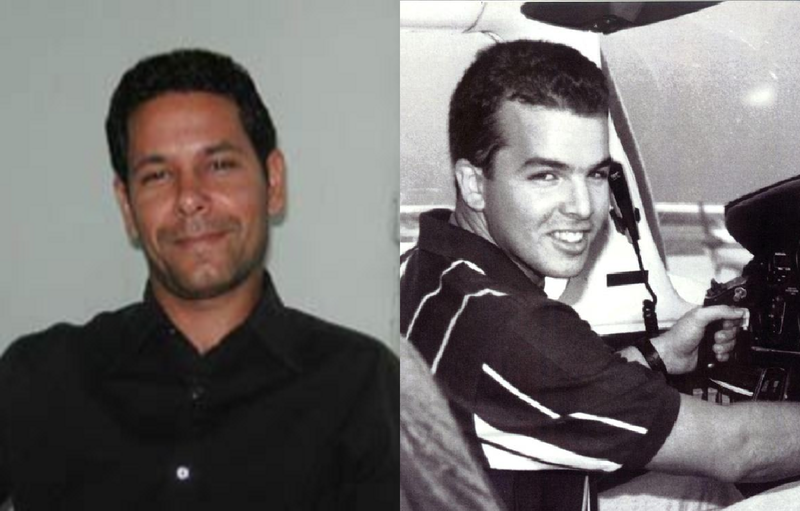 Five months ago today, on July 22, 2012 Oswaldo José Payá Sardiñas and Harold Cepero Escalante, died under circumstances that have still not been cleared up in Cuba. There has been a call for an international investigation and signatures are still being gathered. The objective is to learn the truth of what took place and seek justice. International figures such as Polish Solidarity leader Lech Walesa have added their support in pursuit of the truth. The regime has responded with its own propaganda offensive and show trial. At the same time the families of the victims have been denied the opportunity to speak to the survivors or even attend the show trial. 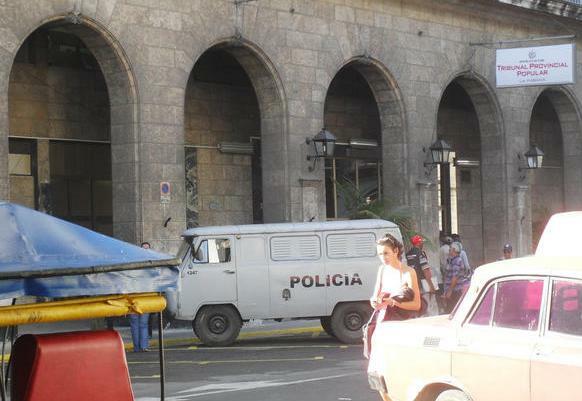 At the same time throughout Cuba the level of repression has more than doubled over the past year. Oswaldo and Harold are no longer physically with us but their spirit lives on as does the Christian Liberation Movement and its principled nonviolent resistance to the dictatorship in Cuba. Over the years may have been skeptical about the reality of an opposition movement in totalitarian Cuba. Despite courageous actions over the years many would ask themselves and sometimes openly exclaim how is it possible for someone to continue to challenge this ruthless dictatorship and survive? Add to that the dictatorship does create its own opposition front groups and infiltrate opposition movements. However, the reality that the regime has to engage in these practices should also indicate that there is an authentic opposition that they are trying to crush. Havel's tragic observation that "martyrdom does better than thought"is also a response to these doubters and skeptics. When Oswaldo José Payá Sardiñas and Harold Cepero Escalante died under these suspicious circumstances many who in the past had attacked Oswaldo now demonstrated their posthumous solidarity with him and his family. 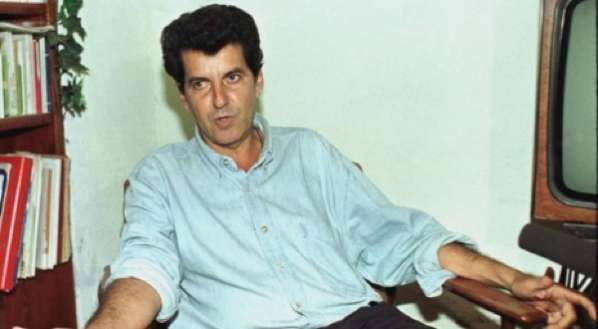 Nevertheless, real dissidents such as Václav Havel could see in Oswaldo Payá not only the sincerity of his convictions but the danger that such a courageous stand meant for his Cuban friend. 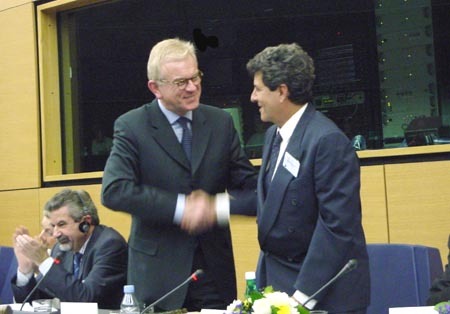 Over the years Havel would engage in actions to raise the profile of Cuban dissidents, and of Oswaldo Payá in particular. 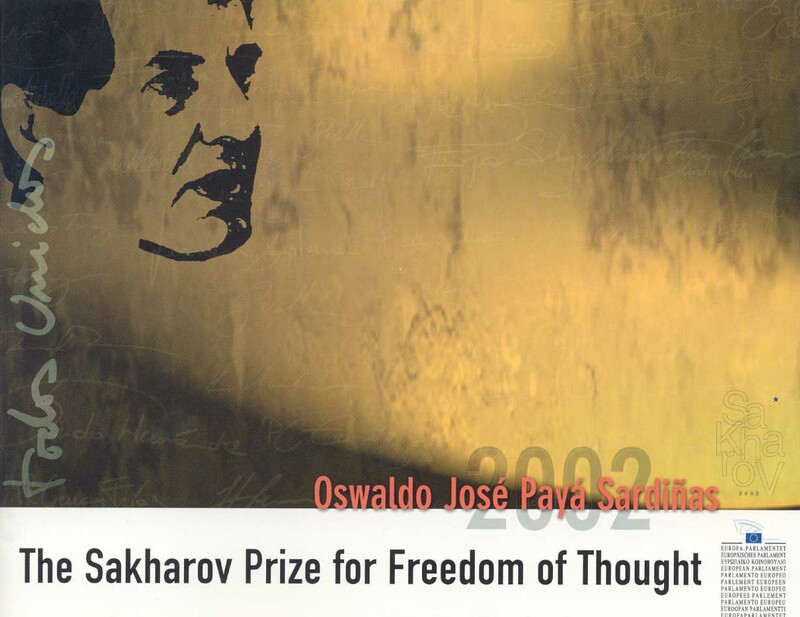 Václav Havel's efforts achieved concrete results such as Oswaldo being awarded the Sakharov Prize ten years ago on December 17, 2002 and twice nominated him for the Nobel Peace Prize. 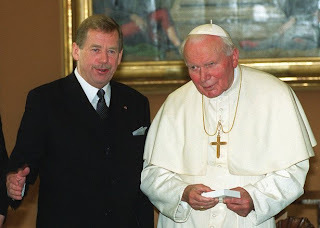 Following Havel's death last year on December 18, 2011 on January 6, 2012 Oswaldo on the anniversary of Charter 77 addressed a Czech audience and remembered his friend. The Václav Havel Library has archived the video address of Oswaldo Payá that is embedded at the top of the page. "For the real question is whether the brighter future is really always so distant. What if, on the contrary, it has been here for a long time already, and only our own blindness and weakness has prevented us from seeing it around us and within us, and kept us from developing it." Václav Havel: Christmas is the holiday of the advent of hope to this world. 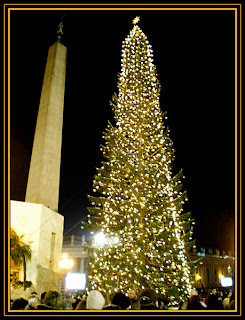 On December 18, 1999 Václav Havel presented a Christmas tree to His Holiness Pope John Paul II and made the speech reproduced below. Twelve years later to the day on December 18, 2011 Havel passed away. Nevertheless it remains as relevant today, despite all that has happened since then, as it was 13 years ago. It is a great privilege to be able to present , on behalf of the Czech Republic, to the Vatican and the city of Rome, a Christmas tree which will stand this year on this famous square, and to be able to greet you all from this site. It is also a great privilege for the Czech Republic and all its citizens, irrespective of their denominations, that it has been namely our country which was asked to decorate this place at Christmas at a time when we are all preparing for the advent of the jubilee Year 2000. Since ancient times jubilee years have traditionally served as an appeal for reflection and reconciliation. I have deep respect for the persistent effort of the Holy Father to have this dividing line of epochs inscribed by the Catholic Church and, generally, by all people of good will into the history of the world as a time of universal reconciliation, reconciliation of nations, cultures, spheres of civilization, and thus, especially, as a time of new and better mutual understanding between followers of different faiths. For a long time I have been deeply convinced that the good future of this civilization depends on how well and how quickly is mankind able to find and understand again the absolutely fundamental spiritual values and principles common to all religions. We all know what they comprise: respect for the miracle of creation, of the creation of the world, Nature, life, and the human being, as well as respect for the moral order growing out of this miracle. I am sure that without the restoration of these values mankind would hardly be able to face all the threats looming over civilization. People, simply, should not focus so much on what makes their spiritual traditions different, but much more on what they have in common and what is being revealed today by the dialogue between various religions. I am convinced that if we were to descend to the very depths of our diverse traditions, we would start finding common roots and perceiving them much more strongly as merely different branches of the same tree. A tree of certainty that all that is has its source, its order, its inspiration and its memory beyond us and above us. I shall be happy if the Christmas tree which I have brought from the Czech Republic could symbolize, amongst other things, the spiritual reconciliation between the different branches of human spirituality based on the awareness of their common trunk and common roots. This tree grew in a country which used to be depicted on ancient maps as the heart of Europe, and now it will light up in the city which used to be considered Europe's head. It would be wonderful if it could also remind us that the spiritual reconciliation and spiritual rebirth, to which we attach our hopes at the divide of epochs, must grow from harmony between head and heart. Christmas is the holiday of the advent of hope to this world. Let the coming jubilee year bring all people of good will new hope that the human family will, after all, find a way of averting the dangers which it is inflicting upon itself. I greet you, I wish you a Merry Christmas, and, especially, peace with the world, with Nature, with your brothers and sisters and with yourselves! Text taken from Havel's official website. Pope John Paul II's address to Havel and the Czech pilgrims. Members of the Ladies in White and their loved ones over the course of 2012 have been subjected to death threats, physical assaults, arbitrary detentions and knife attacks. The previous year saw one of the founders of the movement die under suspicious circumstances. The Ladies in White were founded in March of 2003 following a massive crackdown on the 18th of that same month in which over 100 activists were detained of which 75 were sentenced in show trials to up to 28 years in prison for their nonviolent defense of human rights and liberties. 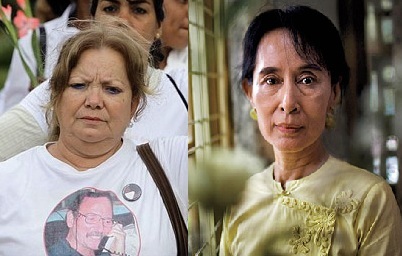 These courageous women succeeded in obtaining the freedom of their loved ones after long years of struggle and have continued in their effort to free all remaining political prisoners and to see that the laws are changed in order to ensure that their are no more prisoners of conscience in Cuba. 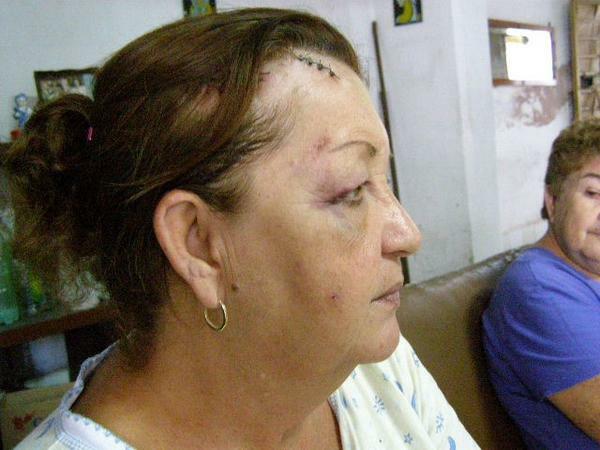 The regime in Cuba has responded with violence and arbitrary detentions. The Ladies in White have responded by redoubling their efforts and expanding their nonviolent movement. 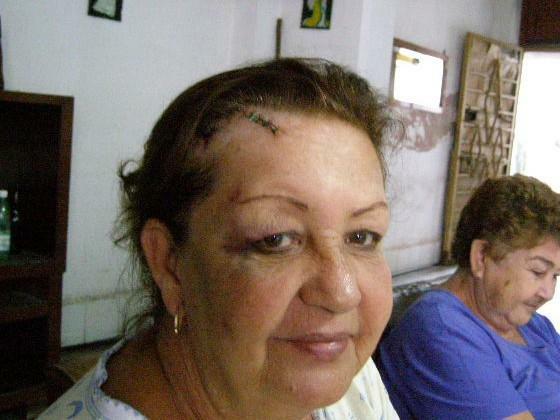 On the eve of International Human Rights Day and on December 10, 2012 itself more than a 100 of these women were arbitrarily detained, many of them violently by agents of the government of Cuba. 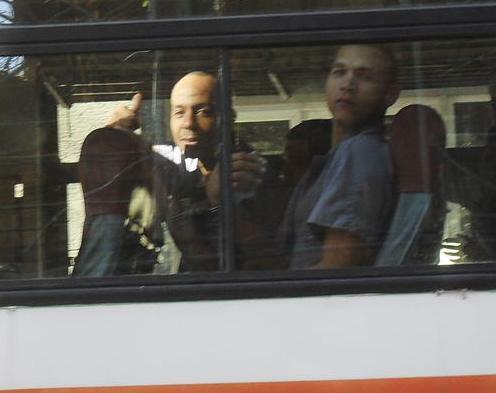 Over the course of 24 hours, according to Hablemos Press, there were 207 politically motivated detentions across Cuba. This was done in order to prevent them taking part in activities on Human Rights Day. Others had their homes laid siege to and were unable to leave their homes without being attacked by regime organized mobs. On December 18, 2012 the dictatorship used its state security apparatus to block streets, threatened and detained women in an effort to stop them from holding their Literary Tea gathering. Despite all of this, these courageous women continue to meet and march demanding an end to the systematic violation of human rights in Cuba, and the immediate liberation of all of Cuba's prisoners of conscience. "We are women who are conscious of our nonviolent struggle against injustice and for freedom. If they throw us to the floor, we will stand up. No matter how many times it takes." Human rights defenders in the Americas play a vital role in exposing and combating human rights violations. Many have paid a high price for their courageous efforts to break cycles of injustice, discrimination and impunity. Please take a minute and sign the petition to defend human rights defenders in the Americas and the Ladies in White in particular. The judicial farce with regards to the independent labor activist Ulises González Moreno ended this afternoon confirming that he will serve two years in prison for preserving his dignity as a person. Beginning at 9:00am this morning there was a hearing at the Popular Provincial Tribunal of Havana to consider an appeal to the two year prison sentence. The term "farce" is not an exaggeration because the Cuban criminal code criminalizes dissent and secondly as recognized by the Inter-American Commission on Human Rights: " there is no separation of powers in Cuba which, in this case, would guarantee the independence of the administration of justice." "Criminal Code offense of 'dangerousness,' which allows authorities to imprison individuals before they have committed any crime, on the suspicion that they are likely to commit an offense in the future. This 'dangerousness' provision is overtly political, defining as 'dangerous' any behavior that contradicts Cuba's socialist norms." According to article 72 "any person shall be deemed dangerous if he or she has shown a proclivity to commit crimes demonstrated by conduct that is in manifest contradiction with the norms of socialist morality" and article 75.1 states that any police officer can issue a warning for such "dangerousness". The declaration of a dangerous pre-criminal state can be decided summarily. A warning may also be issued for associating with a "dangerous person". Therefore the decision of what was to be done Ulises was decided before the hearing even began and the charge made against him was in and of itself a travesty. Ulises González Moreno was found "guilty" on November 28, 2012 of the charge of "social dangerousness." The day before the trial, November 27, 2012, he was made an offer by State Security to spy on the other activists in the independent labor organization he is a member of in order to avoid prison. Ulises rejected the "offer" telling the political police: "Take me to jail right now, I'm no snitch." Tomorrow at 9:00am will be the oral appeal hearing for independent labor activist Ulises González Moreno. The hearing against labor activist Ulises González Moreno will be in the Popular Provincial Tribunal of Havana. Independent labor activist Ulises González Moreno will be represented tomorrow at the appeal hearing by counsel Amelia Rodríguez Cala. At 9:28am today Ivan tweeted: The trial of independent unionist Ulises González Moreno just ended , the tribunal said it was conclusive for ruling. Court said that during the course of the day it would reveal the outcome of the trial against independent unionist Ulises González. Regime's ministerial prosecutor recommended keeping the conviction of two years imprisonment for independent unionist Ulises González. Counsel Amelia Rodriguez said her client was here charged with a political offense, not "high level of social dangerousness." The defense attorney said that Ulysses González has ties to work, meets only with his family and that it was reflected in his preparatory record. Counsel Amelia Rodriguez at the trial showed documents proving Ulysses González is a member of the CTIC, and the prosecution accepted documents. Ivan Herandez Carillo concluded at 9:40am over twitter that, "The dictatorial regime that badly governs our country does what it wants and lawyers are figureheads, sad to say." At 1:16pm Ivan posted a photo of Ulises over twitter writing: "Photo of Ulises González Moreno showing his firmness despite farce regime carried out against him." At 1:20pm Ivan reported: "Jaqueline Dali Knight just informed me her husband, Labor activist Ulises González Moreno had just been condemned to two yrs in jail"
Labor activist Ulises González Moreno is to spend the next two years in prison because he advocated for the rights of Cuban workers and refused to spy on his friends and colleagues. Václav Havel died a year ago yesterday, and it is a fitting tribute to this profoundly decent man that his admirers honor him in a way that also recalls not only his sense of humor but also the importance he placed on humor in the defense of a free society. 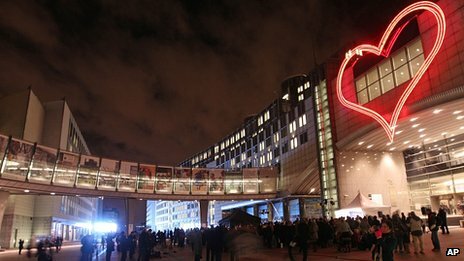 Candles arranged as hearts have been positioned near places he used to frequent, moments of silence held and in Brussels a large neon heart is on display in his honor, but back home Czechs have also launched a campaign to remember this great man in a way that he would have appreciated. "There are no exact guidelines. There are probably no guidelines at all. The only thing I can recommend at this stage is a sense of humor, an ability to see things in their ridiculous and absurd dimensions, to laugh at others and at ourselves, a sense of irony regarding everything that calls out for parody in this world. In other words, I can only recommend perspective and distance. Awareness of all the most dangerous kinds of vanity, both in others and in ourselves. A good mind. A modest certainty about the meaning of things. Gratitude for the gift of life and the courage to take responsibility for it. Vigilance of spirit. Those who have not lost the ability to recognize that which is laughable in themselves, or their own nothingness, are not arrogant, nor are they enemies of an Open Society. Its enemy is a person with a fiercely serious countenance and burning eyes. " An example of this ability to make fun of himself, while at the same time making a serious point was a story Havel told about how he was systematically followed by the secret police in the video below taken from a documentary. On one occasion when he was going to a sauna, the two state security officials were a bit on the elderly side and asked Havel to wait because they were afraid to follow him into the sauna with their bad hearts. So, Václav Havel waited until "a pair of athletes showed up." We were looking for a way to honour the memory of Václav Havel, in a way that would be distinctive, memorable and simple so that it can be followed by the largest number of well-wishers. We were inspired by “Towel Day” in honour of Douglas Adams. Each year, the memory of the late author is honoured by thousands of people around the world when they carry a towel, a symbol of his most famous book, The Hitchhiker’s Guide to the Galaxy. We were therefore looking for similarly distinctive gesture to honour Václav Havel’s legacy. We were inspired by an episode from the beginning his presidency, when he appeared in public several times wearing noticeably short trousers. Havel was often interviewed about it and he regarded the episode as quite humorous. We believe that we have found a gesture that can be followed by everyone. A gesture that is humorous, non-violent but significant and perhaps even very Czech like. It can be easily explained, you can support the initiative at any time throughout the day, and if you are reminded by someone else wearing rolled up trouser legs. Therefore the campaign "Short trousers for Václav Havel" was a great way to honor this man's life and to do so with humor on the one year anniversary of his passing. Hopefully, this will be the beginning of an annual tradition to remember this great son of the Czech Republic. The Facebook page already has over 5,000 followers. 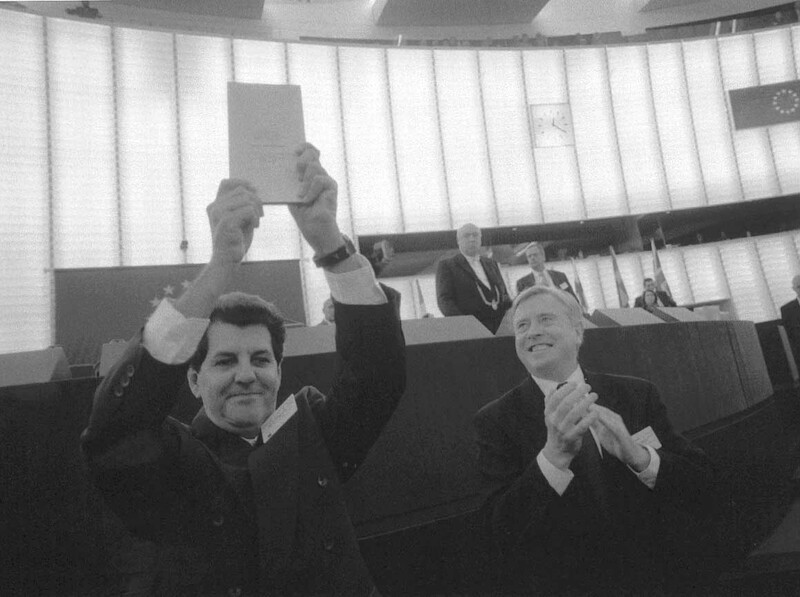 Ten years ago today, Oswaldo José Payá Sardiñas was in Strasbourg, France at the European Parliament receiving the 2002 Sakharov Prize for Freedom of Thought. He was the first Cuban to be awarded this great honor named after a courageous Russian dissident and nuclear physicist. 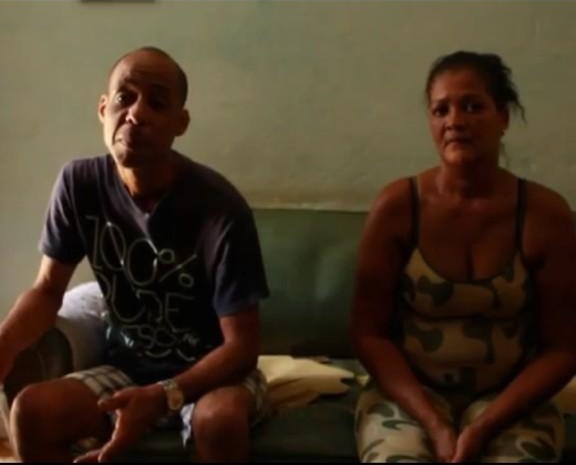 Its hard to believe that ten years have already passed since that day when Oswaldo spoke to the world about the aspirations of Cubans to live in freedom with dignity. It is even more difficult to know that Cubans have lost a great Christian nonviolent leader who would have been a critical force for offering a much needed combination of principled yet pragmatic leadership in the midst of a democratic transition. Although we have lost the physical presence of the man his writings and example live on as does the Christian Liberation Movement (MCL) that he founded. With that in mind, today is a good day to review and reflect on some of the key ideas that he expressed in the heart of the European Union ten long years ago. Let us also remember that he could have stayed and become another Cuban exile but instead made the decision to return to Cuba and risk everything for the freedom of his homeland. "Father Felix Varela has taught us that independence and national sovereignty are inseparable from the exercise of basic rights. We Cubans – whether we live in Cuba or in the diaspora – are a single people and we have both the determination and the ability to build a just, free and democratic society, without hatred and without the desire for revenge. In the words of José Marti, ‘With everyone and for everyone’s benefit’." "We have not chosen the path of peace as a tactic, but because it is inseparable from the goal for which our people are striving. Experience teaches us that violence begets more violence and that when political change is brought about by such means, new forms of oppression and injustice arise." "This time we shall bring about change by means of this civic movement which is already opening a new chapter in Cuba’s history, in which dialogue, democratic involvement, and solidarity will prevail. In such a way we shall foster genuine peace. 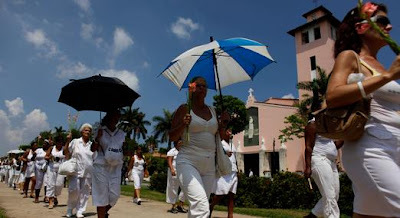 Cuba’s civic combatant heroes – the ordinary people who have signed the Varela Project – carry no weapons. Not a single hand is armed. We walk with both arms outstretched, offering our hands to all Cubans as brothers and sisters, and to all peoples of the world." "There are still those who perpetuate the myth that the exercising of political and civil rights is an alternative to a society’s ability to achieve social justice and development. They are not mutually exclusive. The absence of any civil and political rights in Cuba has had serious consequences such as inequality, the poverty of the majority and privileges of a minority and the deterioration of certain services, even though these were conceived as a positive system to benefit the people." "It is becoming increasingly apparent that well-being and economic and social progress are the fruits of being able to exercise one’s rights. In the same way, a democracy is not genuine and complete if it cannot initiate and sustain a process that raises the quality of life of all its citizens, because no people would freely vote for the kind of poverty and inequality that results in the masses becoming disadvantaged and marginalized. The peoples of Latin America are calling for a genuine democracy which will enable justice to be established. It is scandalous that methods intended to overcome a crisis and end poverty can be applied in the name of efficiency when in reality they threaten to obliterate the poor." "We now know that any method or model which purportedly aims to achieve justice, development, and efficiency but takes precedence over the individual or cancels out any of the fundamental rights leads to a form of oppression and to exclusion and is calamitous for the people." "The cause of human rights is a single cause, just as the people of the world are a single people. The talk today is of globalization, but we must state that unless there is global solidarity, not only human rights but also the right to remain human will be jeopardized." "If there is no solidarity between people we will be unable to preserve a fair world in which it is possible to continue living as human beings. I therefore humbly believe that rather than new models, both for societies and for relations between countries, what we need is a new spirit." "We dedicate this prize and our hopes to the Lord Jesus, born in a lowly manger. Thank you and Merry Christmas." In the end Oswaldo paid the ultimate price for freedom. Let us remember and honor him by seeking the truth about the circumstances surrounding his death and the death of MCL youth leader Harold Cepero on July 22, 2012. 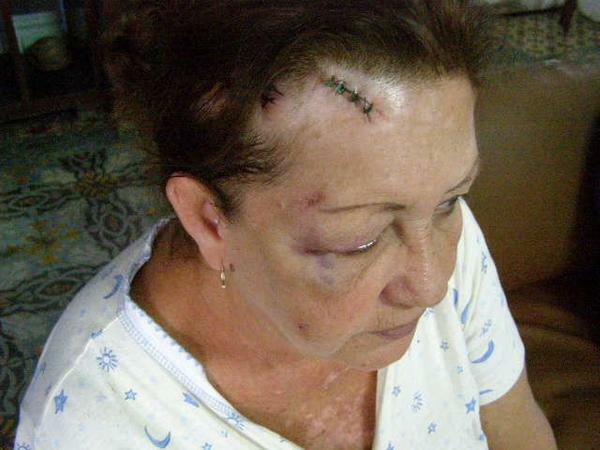 At 12:11pm today, December 17, 2012, independent journalist and civic activist, Ivan Hernandez Carillo, began to tweet photos of disturbing images of Marina Montes Piñón, a 60 year old woman and long time opposition activist, who had been badly beaten by regime agents on December 15 in Cuba. Ivan reported over twitter on how she ended up in such a state. Independent journalist Juan Carlos Linares Balmaseda initially broke the story, disclosing the assault on Marina Montes Piñón and Ivan got the word out through the twitterverse. 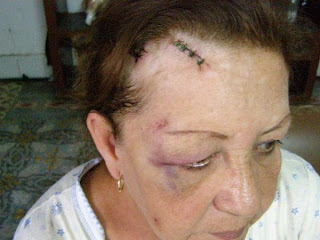 That is how the regime's State Security left opposition activist Marina Montes Piñón this past December 15. Marina Montes Piñon has been a member of the November 30th Party, Leonor Perez Mothers Committee, CAPPF and is an active member of: "Those who do not shut up"
With a blunt object, Gisela Espinosa, came from State Security and attacked opposition activist Marina Montes Piñón who is 60 years old. 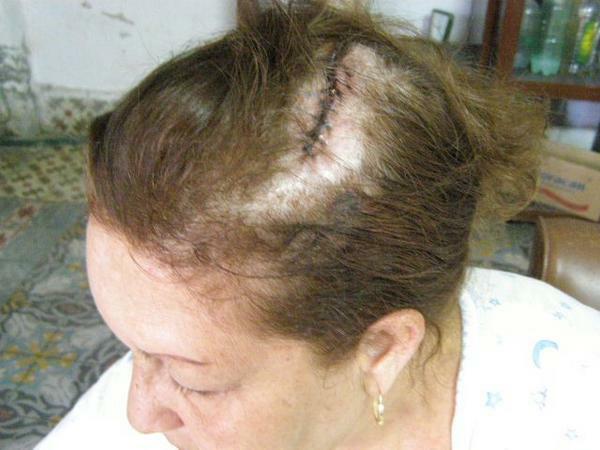 Almost 30 stitches in total for deep wounds in skull given to Marina Montes Piñón by a State Security sponsored attack. New violent attack orchestrated by political police and State Security against another regime opponent: Marina Montes Piñón.